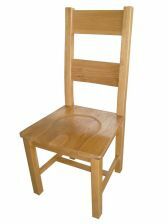 The Chester Country Oak Ladder Back Timber Seat Dining Chair is manufactured from an American Oak which is sourced from sustainable forests. The oak is then finished with an oiled wax which brings out the natural beauty and the characteristics of the American oak. 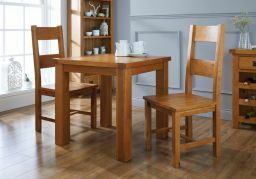 All of the Country Oak chairs are made with very strong and resiliant mortise and tennon joints which are then glued to make these on of the strongest and hard wearing oak dining chairs that we offer. Note: These chairs come fully assembled in their own boxes. Beware of cheaper flat pack chairs! Price shown is per chair. Beatiful table and chairs. Looks firm and classic at the same time. Great customer service and delivery team. 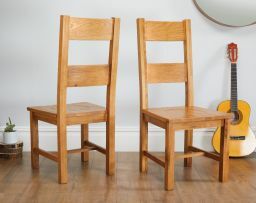 Great solid chairs - arrived complete - no construction to do. Arrived in time for Christmas and survived being christened by all the grandchildren. At first wondered whether I should have had cushions but after using them they are comfortable without. Great value chairs. We are very pleased with both the helpful service in the showroom and the excellent quality and appearance of the furniture purchased. Delivery was quick and efficient.